Proteinuria is a common problem encountered in the treatment of renal transplant recipients, occurring in up to 45% of patients. Proteinuria from native kidneys falls rapidly after renal transplantation, and persistent or worsening proteinuria is usually indicative of allograft pathology. Biopsy studies of transplant patients with proteinuria have confirmed that transplant-specific diagnoses (transplant glomerulopathy, interstitial fibrosis and tubular atrophy, and acute rejection) are more commonly found than other proteinuric conditions, such as glomerulonephritis. As in the nontransplant setting, proteinuria is associated with worse clinical outcomes, including an increased risk for death, cardiovascular events, and graft loss. Blockade of the renin-angiotensin-aldosterone system with angiotensin-converting enzyme inhibitors and angiotensin receptor blockers will reduce proteinuria, but the long-term effect of these medications on patient and graft survival remains unknown. At a given estimated GFR (eGFR) in the nontransplant population, the risk for mortality, cardiovascular disease events, and progression to kidney failure are independently increased in patients with higher levels of proteinuria (1). The National Kidney Foundation's Kidney Disease Outcomes Quality Initiative (KDOQI) guideline on chronic kidney disease (CKD) implemented proteinuria as an indicator of kidney damage as well as a diagnostic criterion for CKD (2). Tonelli et al. (3) recently validated a new five-category system for risk stratification in patients with CKD, based on the combination of eGFR and proteinuria measured by albumin-creatinine ratio (ACR) or dipstick urinalysis. They concluded that the new risk system will better identify patients who have CKD and are at risk for doubling of serum creatinine or ESRD while potentially reducing unnecessary referrals (3). In renal transplant recipients, proteinuria is associated with kidney damage and is a predictor of graft loss (4,5). It is also associated with higher risk for mortality and cardiovascular disease events (6,7). Accordingly, the 2009 Kidney Disease: Improving Global Outcomes (KDIGO) clinical practice guideline on the care of the kidney transplant recipient (8) suggested measuring urine protein excretion at least once within the first month after transplantation, then every 3 months during the first year, then annually thereafter. Renal allograft biopsy was also suggested (8) for new-onset proteinuria or unexplained nephrotic- range proteinuria to determine whether a potentially treatable cause of graft dysfunction was present. Unfortunately, evidence-based therapies for the management of proteinuria in kidney transplant recipients are limited. The prevalence of proteinuria in kidney transplant recipients varies considerably from 7.5 to 45.0%, depending on the threshold used to define proteinuria (6,9–21). Studies that used a threshold just above the normal limit showed the highest prevalence of proteinuria between 31 and 45% (9–11). Several studies defined proteinuria as >1 g/d; with this cutoff, the average prevalence was 19% (6,13–19). Studies that used a high threshold to define proteinuria (>2 to 3 g/d) had a much lower prevalence of proteinuria with an average of 13% (6,20,21). These data suggest that proteinuria is a common problem after kidney transplantation, approximating values reported in a cohort of predialysis patients with CKD (22). Although the prevalence and definitions are varied, even low levels of proteinuria are associated with decreased graft survival and as such warrant attention even if it does not reach the higher threshold defined by some authors. In the nontransplant population, thresholds to determine normal from abnormal proteinuria have been established (23). It is not clear whether these same thresholds should apply to kidney transplant recipients given that they have a solitary functioning kidney and their urine may contain additional proteins and peptides not seen in the general population (24). Given the lack of transplant-specific definitions for proteinuria and albuminuria and that low levels of proteinuria have been related to poorer graft and patient survival, the KDIGO transplant guidelines suggest using the same values established for the general population (Table 1) (8). 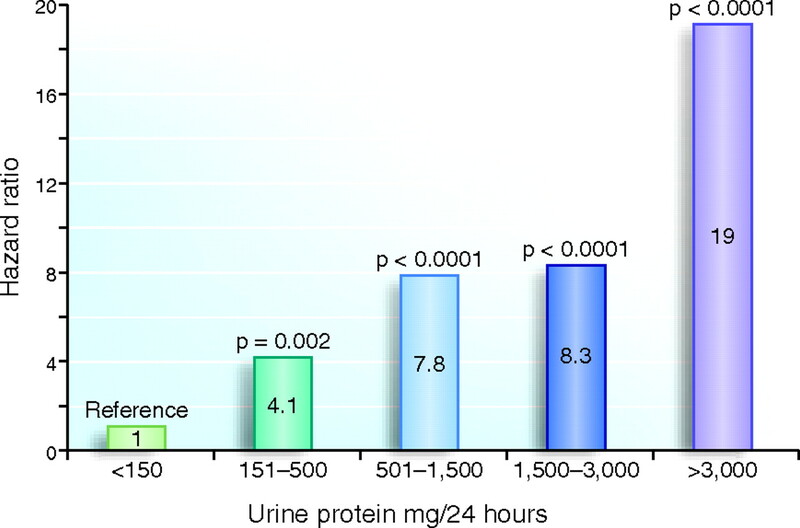 Proteinuria and albuminuria can be quantified with a 24-hour urine collection or by using spot urine collections (ACR or protein-creatinine ratio [PCR]) (23). Because of patient inconvenience and potential collection errors, spot urine PCR or ACR has been recommended to estimate proteinuria in the nontransplant population (25). Although the KDIGO transplant guidelines do not make a specific recommendation on the best method to quantify proteinuria and albuminuria in the renal transplant recipient, they suggest that the ACR and PCR are reasonable screening tests in this population (8). The accuracy of the spot PCR has been studied in renal transplant recipients. In one of the earliest studies, Steinhauslin et al. (26) analyzed the PCR of 133 kidney transplant recipients. A high correlation (r = 0.93; P < 0.001) between the PCR and the 24-hour urine collection was demonstrated (26). In patients with appropriate 24-hour creatinine values, the sensitivity to detect nephrotic-range proteinuria was 99% (26). In a larger study (n = 759 renal transplant recipients), Rodrigo et al. (27) found a similar correlation between the PCR and the 24-hour urine protein excretion adjusted for body surface area (r = 0.921; P < 0.0001). In this analysis, sensitivity of the PCR to detect low levels of proteinuria (<150 mg/d) was limited (73%) but remained high (96%) for the detection of nephrotic-range proteinuria (27). In contrast to these two studies, Torng et al. (28) reported a lower correlation between the PCR and 24-hour total protein in 289 kidney transplant recipients (r = 0.793; P < 0.0001). The sensitivity of the PCR to detect 24-hour protein excretion >500 mg/d was only 85% and dropped even lower for the detection of nephrotic-range proteinuria (28). On the basis of the studies to date, the use of PCR in the transplant population bodes well. However, further study is needed to establish the true bias, precision, and accuracy of the PCR compared with the 24-hour collection. Source of Proteinuria: Native Kidneys or the Allograft? In contrast to the nontransplant setting, the origin of posttransplantation proteinuria is not always straightforward, especially when the patient has significant residual urine output. In a small study, 14 patients who received live-donor transplants had urine PCR measured weekly (29). The average pretransplantation PCR was 2.9 (range 0.5 to 9.2) and normalized in all patients to a value of <0.2 by 10 weeks after transplantation (average time to normalization 4.5 weeks) (29). Similar results were observed by Myslak et al. (30) in a larger study (n = 115) of patients who had proteinuria and received either a living- or deceased-donor transplant. The average 24-hour urine protein level declined from 3650 ± 3702 to 550 ± 918 mg by week 3 after transplantation (30). Of the 61 patients with significant pretransplantation proteinuria (≥1500 mg/d), only 13% had this degree of proteinuria by 3 weeks after transplantation (30). Furthermore, only five patients had an increase in proteinuria of >500 mg/d beyond 3 weeks after transplantation (30). These studies suggest that native kidney proteinuria usually resolves within the first month after transplantation and residual proteinuria or increasing amounts of proteinuria should be assumed to be from the renal transplant (29,30). Several studies have reported allograft pathology findings in patients with proteinuria. Glomerular disease, including recurrent, de novo, and undefined glomerulonephritis, was found on 66% of renal allograft biopsies in transplant recipients with proteinuria >3 g/d (21), whereas only 12 and 11% of biopsies showed a glomerular lesion in patients with 1 and 150 mg/d proteinuria, respectively (9,21). An association between allograft pathology and the degree of proteinuria has been seen in some (9,19,21) but not all studies (15). In one study, 80% of recipients with proteinuria ≥1500 mg/d had glomerular disease on their biopsy (9). Furthermore, an average proteinuria of 2716 ± 2889 mg/d was found in patients with glomerular pathology compared with those with acute rejection (262 ± 389 mg/d) or interstitial fibrosis and tubular atrophy (229 ± 289 mg/d) (9). Overall, transplant-specific diagnoses have been more commonly found on biopsies for proteinuria than native kidney diseases such as glomerulonephritis. In the largest study to date, 58% of transplant patients with proteinuria (≥150 mg/d) had transplant-specific lesions (allograft nephropathy, transplant glomerulopathy, or acute rejection) on biopsy compared with only 11% with glomerulonephritis (9). In seven studies that reported biopsy findings, allograft nephropathy was found in 8 to 54% of patients (average 32%) whereas transplant glomerulopathy ranged from 0 to 39% (average 17%) (9,15,17–21). In comparison, glomerular disease, which was mostly glomerulonephritis, had an average prevalence of 37% (9,15,17–21). Of the commonly used immunosuppressive agents, only sirolimus has been associated with posttransplantation proteinuria. In the recently published Spare-the-Nephron trial, patients who were randomly assigned to sirolimus had a significant increase in proteinuria compared with patients who remained on a calcineurin inhibitor (CNI) (31). The baseline PCR was similar in the two treatment arms (0.20 ± 0.38 and 0.20 ± 0.23) but was significantly different at 12 months as well as 24 months after randomization (sirolimus arm 0.60 ± 1.89; CNI arm 0.20 ± 0.54; P = 0.001) (31). In an analysis of 68 transplant patients switched from a CNI to sirolimus, proteinuria increased from 0.39 ± 0.69 to 1.41 ± 1.39 g/d (P < 0.0001) at 12 months (32). A subset of patients (n = 19) had a significant decline in proteinuria (1.95 ± 2.06 to 0.90 ± 1.41 g/d; P = 0.001) when they were converted back to a CNI and sirolimus was stopped (32). Proteinuria has also been reported in patients who were taking sirolimus and were never exposed to a CNI. Compared with patients who received a CNI-based regimen, de novo transplant recipients who were taking sirolimus and mycophenolate mofetil had a significant increase in the proportion with >100 mg/dl protein on dipstick (38 versus 18%; P = 0.004) (33). Sirolimus use was significantly associated with proteinuria at 1 year (adjusted odds ratio 4.18; P = 0.002) after controlling for important confounding variables (33). Sirolimus use should be considered as a potentially reversible cause of proteinuria in the kidney transplant population. Increasing levels of proteinuria have clearly been associated with worsening graft survival. Figure 1 demonstrates that even low levels of proteinuria (<500 mg/d) were associated with a fourfold increased risk for graft failure (34). For patients with nephrotic-range proteinuria, the risk for graft failure was increased 19 times over patients without proteinuria (34). After a mean follow-up of 46 months, 41.2% of patients with nephrotic-range proteinuria had sustained graft loss compared with only 3.9% of those without proteinuria (34). Although proteinuria is strongly associated with graft survival, other factors, such as donor age, may be equally significant. It is therefore important to consider adjusted analyses when assessing the importance of proteinuria as a risk factor. At least eight articles have evaluated proteinuria as a risk factor for graft loss while accounting for potential confounding variables (6,9–11,14,15,35,36). These articles were reviewed in detail (37) and demonstrate that, on average, patients with proteinuria have a threefold increased risk for graft failure. The relationship between proteinuria at 1-year post-transplant and subsequent graft loss. Even small amounts of proteinuria (151–500 mg/day) are associated with a significant increase in allograft failure compared to those without proteinuria. Decreased patient survival is also seen with increasing amounts of proteinuria. As shown in Figure 2, Roodnat et al. (10) demonstrated that the risk for death increased by 16% (95% confidence interval [CI] 8 to 26%) for each 1.0-g/d increase in proteinuria. In addition, they showed in adjusted analyses that both cardiovascular (relative risk [RR] 1.11; P = 0.047) and noncardiovascular (RR 1.19; P = 0.002) death was increased with increasing amounts of proteinuria (Figure 2) (10). Three other articles examined the association between proteinuria and patient survival after adjustment for important confounders (6,14,35). For proteinuria up to 2 g/d, the RR for death increased by approximately twofold compared with those without proteinuria (37). 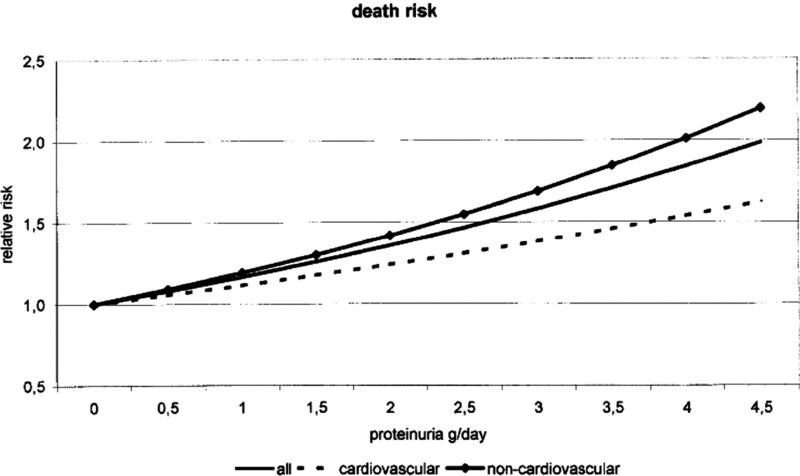 Relationship between proteinuria and patient death. Compared to patients without proteinuria, increasing amounts of proteinuria were associated with both cardiac and non-cardiac causes of death. More recent studies found an association between spot measures of proteinuria and clinical outcomes. In a single-center cross-sectional study, 500 kidney transplant recipients were assessed to evaluate the association among ACR, PCR, and urine dipstick protein with the end point of death-censored graft loss (38). After 2.98 years of follow-up, all three measures of proteinuria were significantly associated with the outcome (38). Using receiver operating characteristic curves analysis, the c-statistic for PCR was 0.82 (95% CI 0.75 to 0.90; P < 0.001) and for the ACR was 0.83 (95% CI 0.76 to 0.90; P < 0.001) (35). Both the PCR and ACR performed better than the urine dipstick (c = 0.76; 95% CI 0.66 to 0.86; P < 0.001) (38). This analysis suggests that spot measures of proteinuria, which are simple and convenient for the patient, are associated with graft survival in a manner similar to the standard 24-hour urine collection. The evidence base for the management of proteinuria, from most causes, is lacking in the kidney transplant population. Nonetheless, we agree with the KDIGO guidelines that recommend monitoring of proteinuria as part of routine transplant follow-up (8). For patient convenience, it seems reasonable to screen for proteinuria using either the PCR or the ACR (8,25). Any positive screen should be confirmed by a 24-hour urine collection (34). Patients with new (as defined in Table 1) or increasing proteinuria that remains unexplained should undergo renal biopsy to confirm the diagnosis (8,34). The KDIGO guidelines recommend biopsy for unexplained proteinuria >3 g/d (8), whereas other experts suggest a lower threshold of 1.5 g/d (34). Given that intervention may be possible for certain diagnoses and important prognostic information will be gained from biopsy, a lower threshold for biopsy (i.e., 1.5 g/d) seems more reasonable. A general approach to proteinuria in the kidney transplant recipient is shown in Figure 3. In the nontransplant population, several therapies were proved in randomized trials to decrease proteinuria and even reduce clinically important end points such as doubling of serum creatinine or the development of ESRD (39–47). In the following section, strategies to reduce proteinuria in the transplant patient are reviewed. 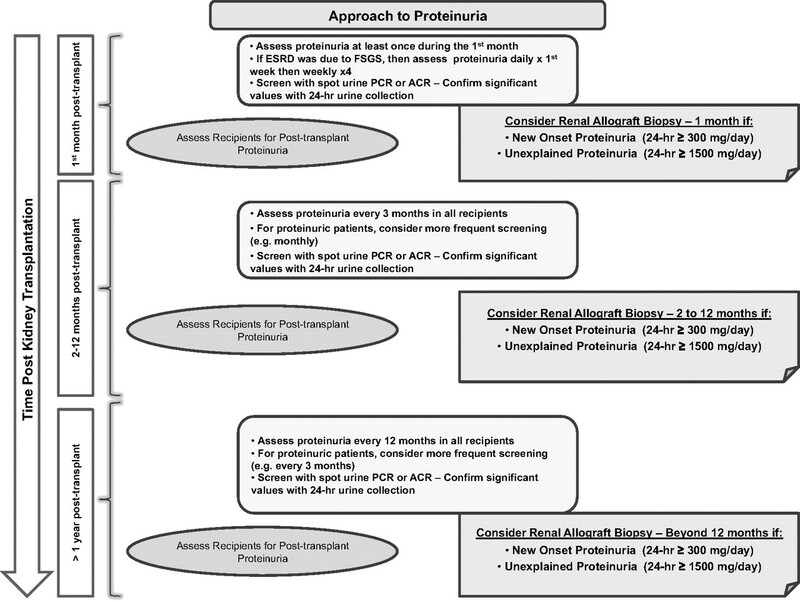 Approach to proteinuria in the kidney transplant patient at different times poet-transplantation. Recommendations adapted from references 8. and 34. Two randomized, controlled trials published in the 1990s evaluated the role of dietary protein restriction in reducing proteinuria in kidney transplant recipients (48,49). A significant reduction in albuminuria and proteinuria was seen with protein restriction of 0.55 or 0.70 g/kg per d (48,49). No data, however, were presented on long-term renal allograft function or survival (48,49). Despite the positive findings, protein restriction has not been used frequently in transplant recipients, perhaps because of the concern of worsening nutritional status in this patient population. A recent systematic review from the Cochrane Renal Group analyzed all antihypertensive trials in kidney transplantation (50). Of 60 trials located in the review, only two (n = 90 patients) evaluated the effect of calcium channel blockers on proteinuria. In these two trials, there was no significant effect of calcium channel blockade compared with placebo on 24-hour protein excretion (mean difference 0.03 g/d; 95% CI −0.25 to 0.32) (50). Despite the lack of effect on proteinuria, calcium channel blockers (n = 17 trials involving 1255 patients) were associated with a 25% reduction in graft loss compared with placebo or no treatment (RR 0.75; 95% CI 0.57 to 0.99; P = 0.04) (50). The effect of pentoxifylline (1200 mg/d) on proteinuria was evaluated in 17 kidney transplant recipients with biopsy-proven chronic allograft nephropathy (51). All patients had been on angiotensin-converting enzyme inhibitor (ACEI) or angiotensin receptor blocker (ARB) for at least 1 year. The 24-hour urinary protein excretion dropped from 2.65 ± 2.15 g/d at baseline to 2.13 ± 1.13 g/d at 3 months (P < 0.05). However, by 6 months, the proteinuria had increased back to baseline level (2.74 ± 0.93 g/d) and was no longer significant (51). Although the investigators reported that pentoxifylline was effective at reducing proteinuria, longer term data are required before recommending this therapy for posttransplantation proteinuria. Blockade of the renin-angiotensin-aldosterone system (RAAS) has become standard therapy for the treatment of proteinuria in nontransplant CKD (40–42). Theoretically, transplant patients should derive even more benefit from RAAS blockade than nontransplant patients given that they have a solitary, hyperfiltering kidney. However, the data supporting this theoretical benefit have been elusive. The observational studies on RAAS blockade have produced varied results. A prospective cohort study from Spain followed 2600 kidney transplant recipients for 4 years (52). Baseline proteinuria, assessed at 6 months after transplantation, averaged 0.4 ± 0.7 g/d, with 13% having >1 g/d (52). At 6 months, 15% of patients were on RAAS inhibitors, but this increased to 45% by the end of the study (52). In a multivariate analysis, the use of RAAS inhibitors at 12 months was associated with 64% higher risk for graft loss at 4 years (hazard ratio 1.64; 95% CI 1.01 to 2.65; P = 0.042) (52). This risk was adjusted for important confounding variables such as donor age, acute rejection, serum creatinine, and BP (52). It is certainly possible that this finding was due to selection bias, with high-risk patients with proteinuria being preferentially started on RAAS blockade. Unfortunately, proteinuria was not controlled for in the multivariate model (52). A recent study by Dahlberg et al. (53) followed patients (n = 500) who received a transplant between 1998 and 2005 at the University of Wisconsin. Mean follow-up was 63.4 ± 28 months, and 24% were on an ACEI or an ARB at 1 year (53). Similar to the recently noted Spanish study (52), ACEI or ARB use was associated with an increased risk for the combined end point of graft failure or death (hazard ratio 1.61; 95% CI 1.04 to 2.51; P = 0.03) (53). However, after controlling for important confounders such as serum albumin, serum creatinine, acute rejection, and time on dialysis, the finding was no longer significant (53). No data on proteinuria were provided in this study (53). In a retrospective cohort study of 2031 renal transplant recipients from Austria, Heinze et al. (54) showed a significant improvement in 10-year patient and overall graft survival in transplant recipients who were receiving an ACEI or an ARB. However, they did not find any effect on death-censored graft survival (P = 0.57), suggesting that the benefit may have been due to a reduction in mortality rather than preservation of graft function (54). Interestingly, the interaction term between RAAS inhibitor use and proteinuria was NS, suggesting that patients both with and without proteinuria benefited from RAAS blockade (54). Opelz et al. (55) reported no significant effect of RAAS inhibitors on graft and patient survival in 17,209 renal transplant recipients. Adjustment for important confounding variables did not change these findings (55). In this analysis, no data were provided on baseline proteinuria, but 34% of patients were on an ACEI or an ARB at 1 year after transplantation (55). Furthermore, the authors showed that treatment with an ACEI or an ARB did not exert a BP-independent protective effect (55). Graft survival was more closely associated to systolic BP at 1 year, regardless of whether an ACEI or an ARB was used (55). This finding suggests that the BP achieved is more important than the antihypertensive agent used to reach the target BP (55). In the previously mentioned Cochrane systematic review, ACEIs were compared with placebo/no treatment in three trials in which proteinuria was reported (n = 175 patients) (50). In these trials, there was no significant effect on proteinuria reduction with an ACEI (mean difference −0.08 g/d; 95% CI −0.23 to 0.06 g/d). When calcium channel blockers were compared with ACEIs (n = 2 trials involving 142 patients), patients on calcium channel blockers had a significantly higher proteinuria (mean difference 0.28 g/d; 95% CI 0.10 to 0.47 g/d) (50). The use of ACEIs in transplantation is not without consequence; patients who were on these medications (n = 5 trials; 265 patients) had a significantly lower hemoglobin level compared with patients who were receiving a calcium channel blocker (mean difference 11.5 g/L; 95% CI 7.2 to 15.8) (50). Because of a small number of trials and heterogeneity in the data, no conclusive statement could be made about the effect of ACEIs on mortality or graft survival (50). Another systematic review focused only on trials involving RAAS inhibitors in transplantation (56). Of the 21 randomized trials located in this review, only four (n = 145 transplant recipients) reported on proteinuria. A decline in proteinuria after ACEI or ARB use was reported in all studies; however, the overall change was NS (weighted mean difference −0.23 g/d; 95% CI −0.52 to 0.06; P = 0.12) (56). The analysis was repeated with the two trials (n = 86 patients) that had at least 12 months of follow-up, and the proteinuria reduction with RAAS blockade was now significant (weighted mean difference −0.47 g/d; 95% CI −0.86 to −0.08; P = 0.02) (56). This analysis also showed that patients who were on RAAS inhibitors had a significantly lower GFR compared with patients who were not on these medications (weighted mean difference −5.7 ml/min; 95% CI −8.7 to −2.8; P < 0.001), and the effect persisted after limiting the analysis to trials with at least 1 year of follow-up (weighted mean difference −5.80 ml/min; 95% CI −10.60 to −0.99; P = 0.02) (56). As with the Cochrane review (50), no conclusion could be made regarding the effect of RAAS inhibitors on patient or graft survival (56). The studies reviewed to date initiated RAAS inhibitors late after transplantation, usually after proteinuria or graft dysfunction had already developed. An intriguing concept is whether RAAS blockade started early after transplantation can prevent allograft damage and proteinuria from occurring. This was the research question evaluated in the ALLOGRAFT Study (57,58) htttp://www.clinicalstudyresults.org/drugdetails/?drug_name_id=162&sort=c.company_name&page=1&drug_id=676. Kidney transplant patients (n = 367) were randomly assigned to losartan or placebo within 4 to 8 weeks after transplantation (57,58). The primary end point, the incidence of allograft nephropathy at 2 years, was not significantly different between groups (placebo 52.8%, losartan 56.7%; P = 0.596) (57). In addition, the severity of allograft nephropathy was not different between the two groups. Interestingly, despite RAAS blockade with losartan, there was no difference in median 24-hour urinary albumin excretion between the treatment arms (100 versus 110 mg/d; P = 0.12) (57). Since publication of the two systematic reviews evaluating RAAS blockade in kidney transplantation (50,56), two additional randomized trials have been published as full peer-reviewed articles (59,60). In the first trial, 502 kidney transplant recipients were randomly assigned to candesartan or placebo (59). The patients in this trial were relatively low risk with only 11% having diabetes and median baseline proteinuria <0.15 g/d (59). The trial was unfortunately terminated early after low event rates were observed. After a mean follow-up of 21.4 months, there was no significant difference in the primary composite end point of all-cause mortality, cardiovascular morbidity, or all-cause graft failure (candesartan 5.1%, placebo 5.3%; P = 0.76) (59). Although there was a statistically significant reduction in proteinuria with candesartan, the absolute change was small and of questionable clinical significance (candesartan, median decrease from 0.12 to 0.11 g/d; placebo, median increase from 0.14 to 0.17 g/d) (59). Consistent with the findings of the systematic review (56), there was a significant decline in creatinine clearance in the candesartan arm compared with placebo (9.8 versus 4.4%; P = 0.002) (59). Amara et al. (60) randomly assigned 47 patients with chronic allograft nephropathy, renal impairment (GFR <30 ml/min per 1.73 m2 measured with 51Cr-EDTA), and proteinuria (≥1 g/d) to either lisinopril or an alternative antihypertensive therapy. After 1 year, there was a significant decline in proteinuria in the lisinopril group (2.8 ± 0.4 to 1.8 ± 0.3 g/d; P < 0.003), whereas there was no significant change in the other arm (1.7 ± 0.2 to 2.0 ± 0.3 g/d; NS) (60). Despite the improvement in proteinuria in the lisinopril group, there was no significant difference in the rate of decline in graft function (lisinopril, ≥4.8 ± 3.0 versus control, ≥2.3 ± 1.7 ml/min/year/1.73 m2; NS) (60). Patients in this study were followed for only 1 year, and no patient or graft survival data were provided (60). RAAS blockade in the kidney transplant population results in a significant reduction in proteinuria. This potentially beneficial effect is accompanied, however, by a significant reduction in GFR and hemoglobin. In addition, there is no evidence that the use of ACEIs or ARBs will improve patient or allograft survival. Given the lack of evidence, RAAS inhibitors should not be used in kidney transplant patients with the specific aim of reducing graft loss and patient death. A randomized, controlled trial has been initiated in Canada to determine whether long-term RAAS blockade will improve clinically important patient outcomes in renal transplant recipients (61). Patients will be randomly assigned to ramipril or placebo, and the primary end point will be a composite that includes doubling of serum creatinine, transplant failure, and death (61). Proteinuria is a common problem encountered in the treatment of renal transplant recipients. Proteinuria from native kidneys falls rapidly after renal transplantation, and persistent or worsening proteinuria is usually indicative of allograft pathology. Biopsy studies on transplant patients with proteinuria have confirmed that transplant-specific diagnoses (transplant glomerulopathy, interstitial fibrosis, tubular atrophy, and acute rejection) are more commonly found than other proteinuric conditions such as glomerulonephritis. As in the nontransplant setting, proteinuria is associated with worse clinical outcomes, including an increased risk for death, cardiovascular events, and graft loss. Blockade of the RAAS with ACEIs and ARBs will reduce proteinuria, but the long-term effect of these medications on patient and graft survival remains unknown. G.A.K. is Principal Investigator of a peer-reviewed, randomized trial sponsored by the Canadian Institutes of Health Research (grant 200504MCT-146229-RAB) evaluating ramipril in kidney transplant recipients and has served on advisory boards or received research funding from Astellas Canada, Roche Canada, Novartis Canada, Wyeth Canada, and Genzyme Canada.